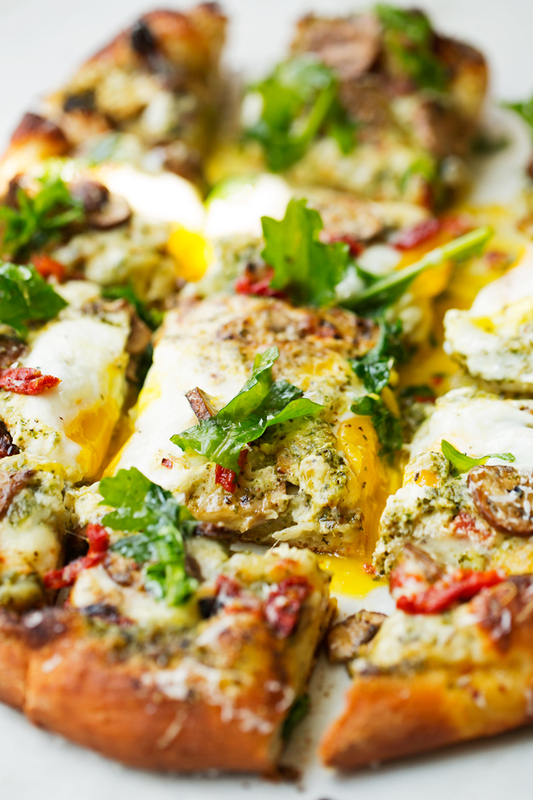 A breakfast pizza topped with sun-dried tomatoes, basil pesto, and fresh eggs. It’s perfect for pizza night or Saturday morning breakfast! 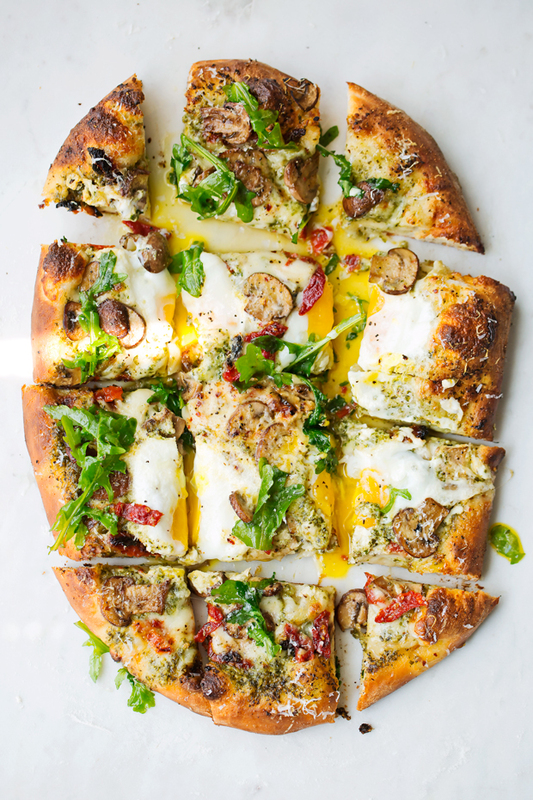 Because breakfast would only be 1000 times better when pizza is on the menu. ???? I am one of those people. You know, the ones that can eat a particular type of food every week and not get tired of it. That’s pizza for me. And this isn’t your regular Friday night pizza. It’s one that you can make on Friday night and again on Saturday morning and still not be tired of it. You know why? —> a homemade crust smothered in basil pesto, sautéed mushrooms, fresh mozzarella cheese, sun-dried tomatoes, and of course, eggs! 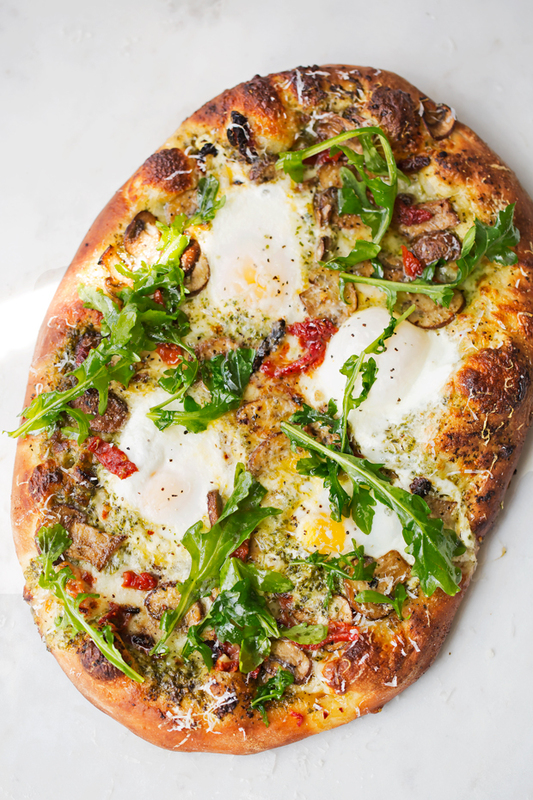 Because what would a breakfast pizza be without eggs, right? A cardinal sin, that’s what. I’m anything but a regular pizza eater. Sure I like the occasion cheese pizza, but I’m more interested in tossing on lots of non-traditional toppings like caramelized onions, feta cheese, sun-dried tomatoes, and sautéed spinach. Eggs and basil pesto are a match made in heaven. Sunday mornings, I like to fold in a teaspoon of homemade basil pesto in with my scrambled eggs. And when you place freshly cracked eggs and pesto on a homemade pizza crust and top it with fresh slices of mozzarella cheese the pizza gods sit back in their thrones and smile because they know you did it right. This is one of those gourmet pizzas that you get when you go to fancy pizza parlors and think to yourself if only you could make this at home! And now you can. It’s a simple recipe, I promise. Breakfast pizza aka the first meal of the day should be easy to make! Okay, so let’s talk ingredients. Sautéed mushrooms. This is entirely your call. 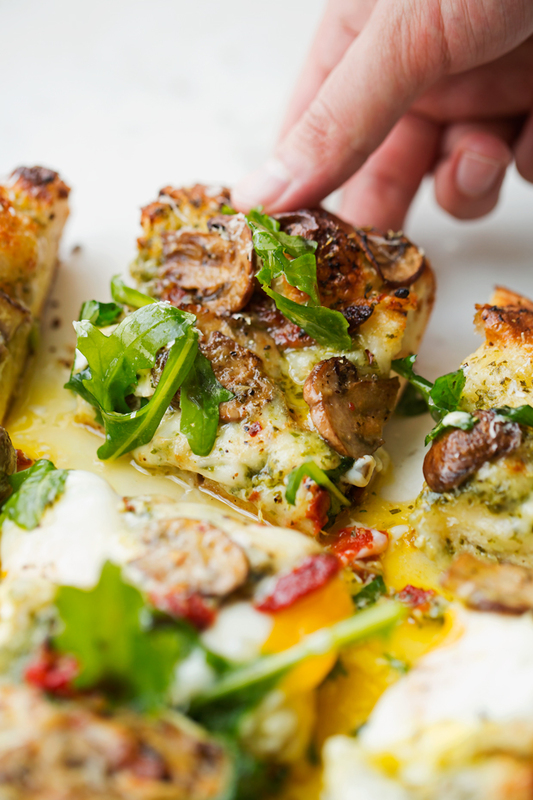 We LOVE quick sautéed mushrooms with a pinch of salt and pepper, and I go a little gaga over the way they make this breakfast pizza all sorts of amazing. I know that not everyone obsesses over mushrooms the way I do and if that’s the case for you, swap it out with roasted bell peppers or anything else you love. Next, comes the basil pesto . We made this on Wednesday, and I promised you guys a recipe that’s well worth it was on its way. Basil pesto is one of the easiest things ever to make. It’s just a little olive oil, basil, parmesan cheese, lemon juice, pine nuts, and I like to add in a teaspoon of lemon zest to help brighten everything up. You could use store-bought pesto, but kids, this recipe needs a pesto that SHINES. The better the pesto, the better the pizza. But my absolute favorite ingredient in today’s pizza recipe is the sun-dried tomatoes. Have you ever opened a jar full of those and just been transported to Italy? Awkwardly enough, I get a mix of sensations. But something about a jar of sun-dried tomatoes reminds me of my childhood too and a particular type of pizza I used to enjoy as a kid. For that reason alone, for me, the tomatoes are the star of this recipe. I used my homemade pizza crust  for this breakfast pizza recipe. We love the way the crust is chewy, tender, crispy, and slightly puffy at the same time. I use honey instead of sugar in my pizza dough. So it’s completely refined sugar-free. The honey also helps give the crust that lovely golden color that pizza crust was made to have. I think my heart just skip a beat thinking about it. And what’s a pizza without toppings? I like to use a handful of sun-dried tomatoes, freshly sliced mozzarella cheese, and hit it with a fresh sprinkling of arugula and lots of parmesan cheese right when the pizza comes out of the oven. Even Anees, who’s a ‘meat lover’s pizza’ kinda guy, loved it. He eats eggs for breakfast every single day, so I knew going in I’d be combining two of his favorites into one flavor packed meal. And oh, was it! I’ve been asked to make more of these kinds of breakfasts. And I plan on making it for more than just breakfast. 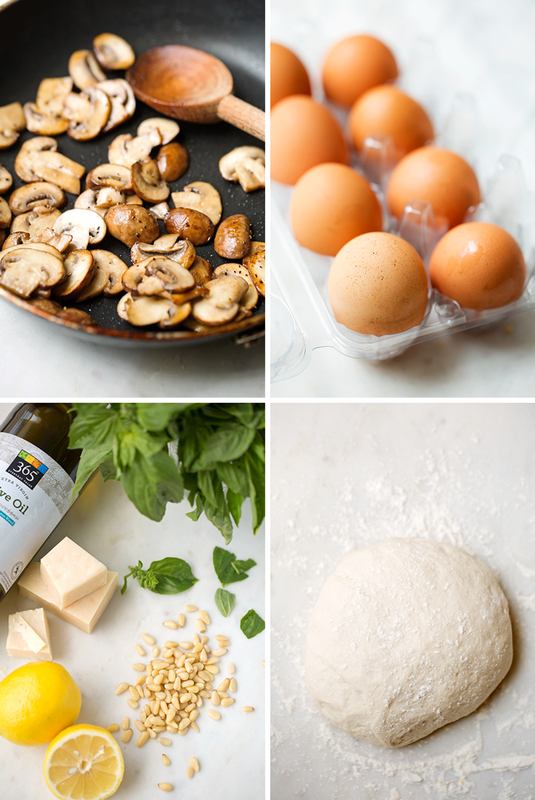 If you’re hosting a get together this weekend, grab some eggs y’all, we’re making pizza! Friday night pizza just got a new twist! 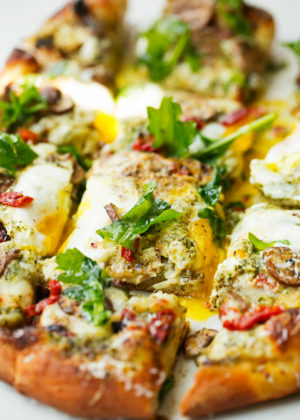 A breakfast pizza topped with sun-dried tomatoes and basil pesto. It’s perfect for pizza night or Saturday morning breakfast! MUSHROOMS: heat the olive oil in a medium skillet over medium high heat. Add the mushrooms and sauce for 3-4 minutes or until they brown just barely. Season with a little salt and pepper. Remove from the heat. PIZZA: Position a rack in the center of the oven and preheat the oven to 475ºF. Flatten the pizza dough into a 12-inch circle. Create a lip or rim by thickening the dough around the crust portion. This keeps everything in. Transfer dough carefully to a parchment lined baking sheet. Let the dough rest for 10-15 minutes. While the dough is resting, crack the eggs in 4 separated bowls of ramekins. Combine the red pepper flakes, Italian seasoning, black pepper, garlic powder, and onion powder in a small bowl. Spread the pesto in a thin layer on each pizza. Arrange the sun-dried tomatoes and mushrooms on top and sprinkle with the prepared seasonings. Top with the mozzarella cheese slices, leaving four wells where you’ll place the eggs later. Bake the pizza on the highest rack for 5 minutes. Remove the pizza. Press the wells with a large spoon if the dough is puffing up. Place each egg in a separate well and place the pizza back in the oven for 5-6 minutes if you want a runny yolk and 7-9 minutes for a more firm yolk. Remove from oven, let stand 1-2 minutes before grating fresh parmesan cheese on top and topping with arugula. Cut into slices and serve immediately! If using homemade pizza dough, use 1/2 the dough and keep the rest for a second pizza. If you aren’t a fan of mushrooms, you can replace them with roasted red bell peppers or sliced olives.